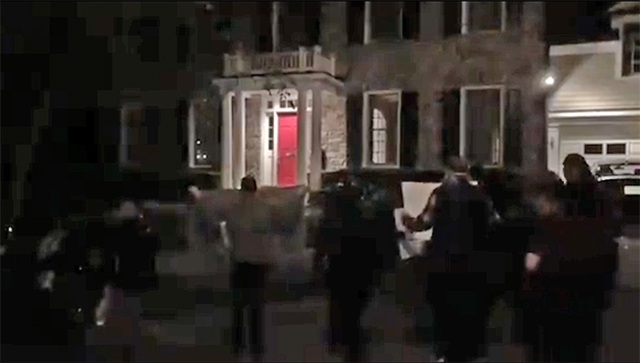 Tucker Carlson's wife was at their DC home Wednesday night when an unhinged leftist mob suddenly tried to smash their door down before screaming "we know where you sleep at night!" Carlson's front door was reportedly "cracked" and the mob spoke of wanting to bring a "pipe bomb" to Tucker Carlson's house. It wasn't a "protest" it was a terroristic threat. 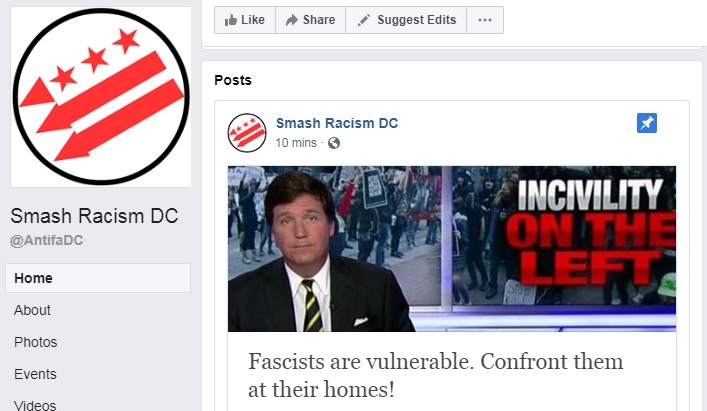 They doxed the home addresses of Tucker and his brother Buckley, as well as Ann Coulter, Sean Hannity and The Daily Caller's Neil Patel and demanded he change his political views. That's the definition of terrorism. They were also shared by "ShutItDownDC," whose Twitter account is still active and filled with threatening language. Both Twitter and Facebook allow these antifa to operate unimpeded (while shutting down right-wingers like Alex Jones for their political speech). Many of these antifa foot soldiers of the establishment also take PayPal and process credit cards without any of the trouble faced by right-wingers. [...] Carlson, a longtime D.C. resident, said he went to "great lengths" to keep his home address private because of his family, who were all "very upset" by the protesters. He added that he loves his home and neighborhood and does not want to move. Instead of hunting down Proud Boys and others for defending themselves and folks like Ann Coulter from these leftist hate mobs, why doesn't the DOJ investigate these groups which are allowed to openly threaten and intimidate right-wingers? They openly advocate for and carry out violence every time a right-winger tries to speak at a college or hold a protest and yet they're not only not prosecuted for their crimes but their victims are targeted while they are actively defended by the state!